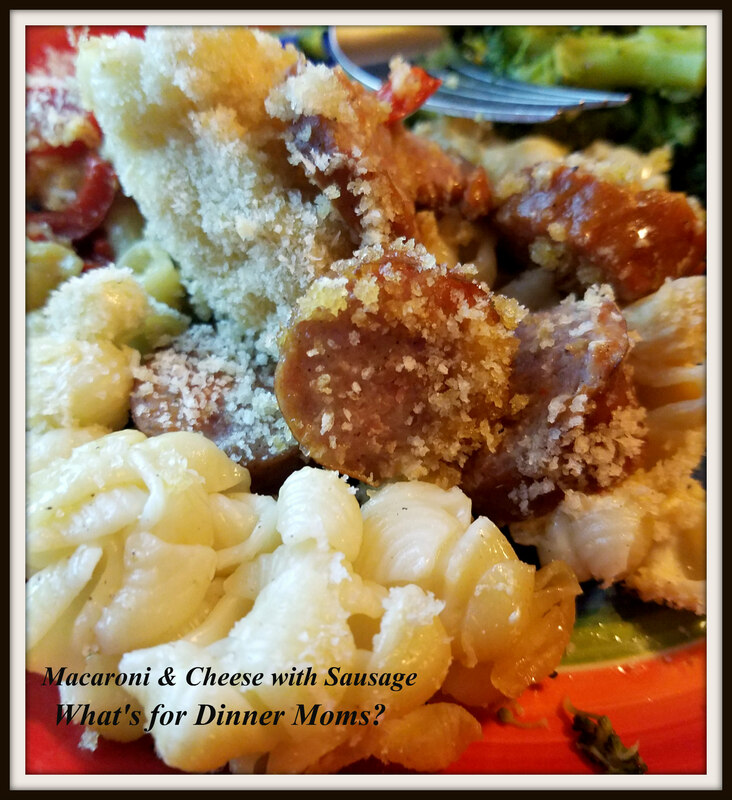 Macaroni & Cheese with Sausage – What's for Dinner Moms? I love smoked sausage or Kielbasa. My family is a bit indifferent to it. I could eat it 3-4 nights a week and not care. So, when I serve it I kind of have to mix it into other things. We often have it with eggs, or potatoes, even macaroni and cheese. This is their favorite way to eat sausage. Tip: This makes a HUGE pan of macaroni and cheese for a large group or plenty of leftovers. Preheat oven to 350 degrees. Spray a 13″ x 9″ pan with non-stick spray. Add sausage to a large skillet; cook and stir over medium heat for 3-4 minutes or until sausage is lightly browned. Remove sausage from skillet; keep warm. Cook macaroni according to package directions. Drain, rinse and keep warm. Melt butter in large saucepan over medium heat. Stir in flour, salt and pepper. Stir in milk. Cook and stir until thickened and bubbly. Cook and stir for 1 minute more. Stir in cheese stirring until cheese melted. Stir in sausage and cooked macaroni. Pour mixture into prepared casserole dish. Sprinkle bread crumbs mixed with melted butter. Bake 20-25 minutes or until edges are bubbling. Never had Kielbasa before. Had mac and cheese this past weekend. Thank you for all you share here, Marci! It is a smoked ring type sausage. Usually found near the bacon or other sausages in the grocery store. Try some sometime if you like hot dogs/ flavored sausages. Just made this last night! A perfect hearty meal for a cold day! Had plenty of leftovers for the fridge and freezer!!! Keep on sharing recipes! Thx!!! Thank you so very much for your feedback! I am so glad you liked it. It makes me so happy.